I recall the Valentines when I purchased a spud gun, to remind him of his youth! Having heard stories of the fun he and his twin brother had as boys in the sixties. It took time and research on my part to find one. Beautifully wrapped in brown paper and string in keeping with the times past. Given with a giggle and a kiss that sealed the start of this gloriously decadent day. For a Valentine should be a measure of your lives a bit of a tickle not too serious, just … fickle. A show of happiness that he already knows and trusts. The receipt of such a gift is unlikely to have ever been given before, like me then, original and unique. Then came my gift from the husband, not wanting to advertise I will not photograph the wrapping. We laugh a lot him and me, and banter constantly. I ate my gift … not enough to spoil the Valentines banquet that I knew he would cook; but enough to make me smile. Unfortunately certain body parts if mine, became targets for testing the power of the innocuous looking spud gun. I can tell you it stings! I really should have thought this through. I know, I am a bit of a loon but I have it on good authority that all the best people are. Thank you Esme for sharing our stories on the salon this Valentine week. Have you had an unusual Valentines gift? Let me know in the comments and click to read more @esmesalon Now! Next PostValentine is A Happy Cat. Just found this post of yours, Ellen. What fun! My boys (husband included) would love a spud gun, but I’d be the one getting pinged by it! Ouch! Sounds like you had a lovely Valentine’s Day! Oh, that spud gun brings back good memories, as do the X-ray glasses I purchased that promised to help me see through clothes when I wore them. The 1970s had some brilliant gadgets that were only available by sending off for them. Hugh tickling childhood memories can bring the most fun especially if who we buy dor are still thinking like children. These sound like fun gifts, Ellen. I don’t usually bother with Valentine’s Day but as I was at a shopping centre to buy a dress for an event next week I actually bought HIM some hand painted chocolates. He will feel bad now because he didn’t get me anything. 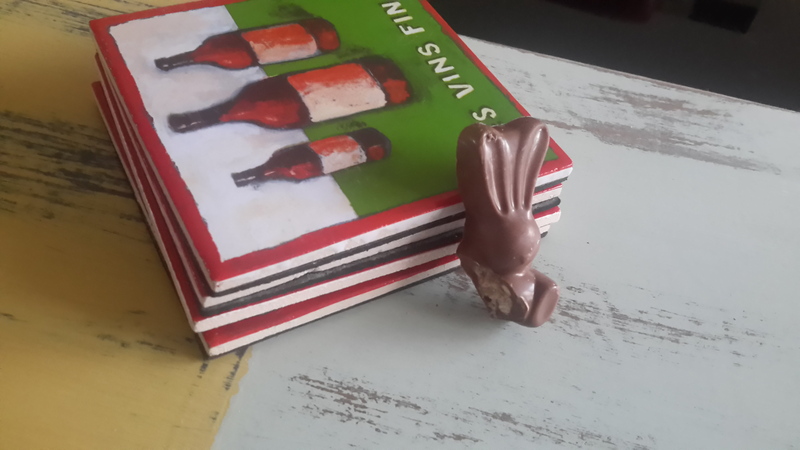 Trying to eat less chocolate- so I would eat that bunny legless or not in a second!! I never came across a spud gun before Ellen.I do remember the guns with “caps” that would give you such a fright. Love the legless bunny. I agree about all the best people being loons – why would we want that any other way? Oh Willow you are so sweet. Thank you. Visiting from Esme Salon – enjoyed your humorous post! those are great memories. I’d have eaten the leg also!! What fun gifts. I always say it is a sense of humour that keeps relationships going!